On the heels of an exciting Turkish Airlines Euroleague debut season, Elan Chalon’s quest to establish itself as one of the best teams in France and a powerhouse in Europe continues in the Eurocup. Chalon won its very first Euroleague game last season and ultimately finished one result short of a spot in the Top 16. The toll of the Euroleague did not stop Chalon from another strong domestic campaign as the club finished the regular season in fourth place and reached the playoff semifinals before falling to eventual champ JSF Nanterre. The club’s journey to this point is remarkable considering that it was an amateur side just two decades ago. 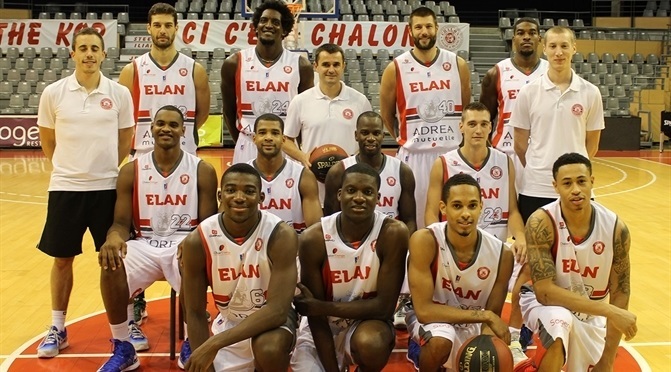 Chalon started to compete in France's National 4 League before its professional division was established in 1994. By 1996, the club reached the country's first division. In 1998-99, it finished fourth and earned the right to play in the Saporta Cup. The 2000-01 season, with Stephane Ostrowski and Robert Gulyas as its big men, marked Chalon’s first prominent run in that competition. Chalon downed FC Porto, Anwil Wloclawek and Pamesa Valencia in the elimination rounds to reach the final against Maroussi in Warsaw, Poland. Ultimately, Maroussi prevailed 74-72 to conquer the title. In 2001-02, Chalon made the French playoffs for a fourth consecutive season and placed fourth. Chalon did even better in 2003-04 by ranking third and losing against Pau-Orthez in the semifinals. In three Eurocup appearances, Chalon never got past the regular season, but registered a respectable 5-5 record in 2005 and 2008, by beating teams like FMP and again, Pamesa Valencia. Despite several quiet seasons, Chalon bounced back in 2010-11 to win its first domestic title – the French Cup. Behind its big guns – Blake Schlib, Marquez Haynes and Ilian Evtimov – Chalon downed CSP Limoges 79-71 in the title game. They also reached the Semaine des As final and came in third at the end of the French regular season, but lost against Asvel Basket in the quarterfinals. Two years ago, the team was built again around Schlib and it reached even bigger heights by capturing the French triple crown; Chalon bested BCM Gravelines in the Semaine des As final, topped Limoges 83-75 for the French Cup and thrashed Le Mans 95-76 in the French League final. Schilb earned French League, Semaine des As and French League final MVP honors, while Steed Tchicamboud, Alade Aminu and Evtimov were also very important for Coach Gregor Beugnot. Moreover, Chalon came within a win of a European trophy; a great Eurochallenge season saw it reach the final four and down Triumph Lyubertsy in the semifinals before losing to Besiktas Milangaz. All told, it was clearly the greatest season at the club, which dates back to 1970. That said, Chalon still dreams of doing even better.